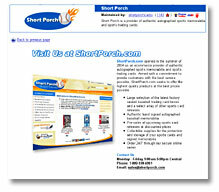 shortporchcards eBay "me" page. Short Porch is an ecommerce provider of authentic autographed sports memorabilia and sports trading cards. The basic layout for this "me" page template was suggested by the client. Starting with his ideas as a foundation, I created a look for the page that would match the fresh, retail feel of the Short Porch website using website colors, logo, and a screenshot of the site itself.